As a leadership team you start by listening to God to understand His purposes for your church. Communication then becomes essential to getting others on board. But, it needs to be more than simply “telling” them with the expectation that all they do is listen to their leaders (in both the sense of hearing and following). If you want to get others on board with following your church purpose, you need to listen to them, not merely tell them. Listening is such an important part of the communication process that we’ve made it a separate category in this practicum. How do they see themselves fitting in? If leaders must start by listening to God, why wouldn’t that also be important for the rest of the Body? Getting on page with God’s purposes for the Church by listening to what He says, isn’t just for leaders. 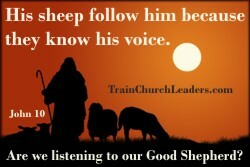 John 10:4 says “his sheep follow him because they know his voice” so why wouldn’t we encourage them to listen to Him? Having a Church Purpose isn’t about people following the expectations of their leaders but rather of God. Imagine how different things would be if we all were convinced God wants us to go a certain direction. When His sheep hear His voice, they follow (Jn. 10:4). Consequently, we would spend far less time pushing and pulling people along. And, we would be much more unified in our efforts to live out His purposes. I praise God for using this in your life, Pastor Mulapwa.